Pupils from three Fife primary schools helped kick racism into touch as they took part in an anti-racism seminar at East End Park on Monday, 8th March 2010. The event involving important names from the world of football and politics gave pupils from the local schools a chance to explore issues of racism and hear positive anti-racist messages, as well as getting the chance to meet an ex-Scotland International and players from Dunfermline Athletic FC. Show Racism The Red Card (SRTRC) is an anti-racist charity, established in January 1996. Their aim is to combat racism through enabling role models, who are predominantly but not exclusively footballers, to present an anti-racist message to young people and others. As part of their programme to educate young people on anti-racism, they regularly organise seminars in partnership with local football clubs and schools. 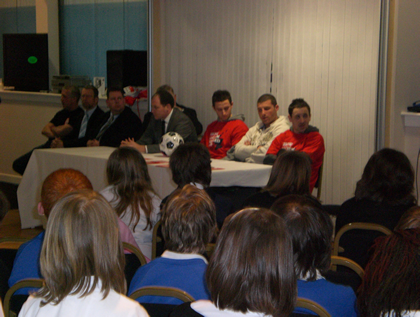 Dunfermline Athletic FC players Austin McCann, David Graham and Steven McDougall attended this event at East End Park. This event has been organised together with Dunfermline Athletic Football Club (DAFC) and the children will have the opportunity to ask questions from a panel including Dee Kinning (SRTRC), players from DAFC, Gary McKay (ex Scotland and Hearts Player) and John Park (MSP). A spokesperson from DAFC said, "DAFC are delighted to have been asked to be involved in this event. As a major part of the Community in West Fife we have a part to play in kicking racism out of football and society in general. This is the second event of its type held here at East End Park and we hope to continue this partnership with Show Racism the Red Card for many years." We would like to thank all those that made this event possible. We would especially like to thank Commercial Primary, Masterton Primary and St Bride's Primary for attending the event and their very positive input throughout the day.